NASA and the European Space Agency's Hubble Space Telescope has been in low Earth orbit for nearly 28 years, but with several repairs and upgrades over the decades it's still sending back beautiful images. 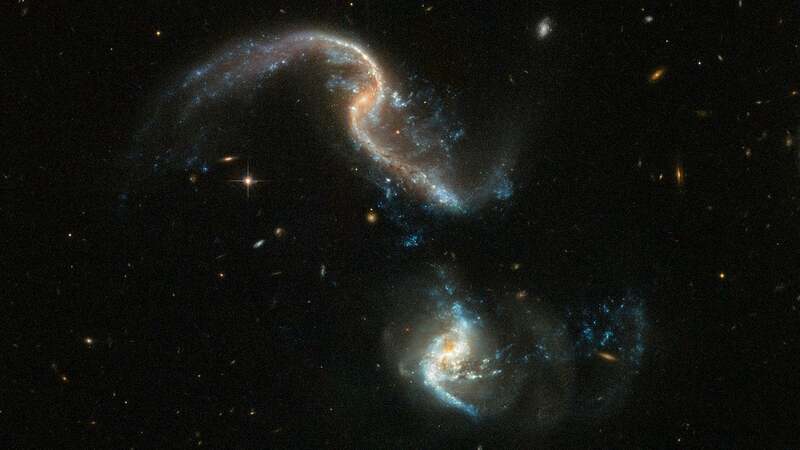 Just a few days ago, the ESA released this Hubble image of a pair of barred spiral galaxies some 350 million light years away in the process of merging, their two galactic nuclei still separated by a massive distance but throwing out clouds of hot gas and mid-formation stars. According to an ESA blog post, the galaxy pictured on top has unusually long tidal tails, "long, extended ribbons of gas, dust and stars." Regions that appear blue are "stellar nurseries" which are still in the process of generating new stars. Arp 256 was first catalogued by Halton Arp in 1966, as one of 338 galaxies presented in the aptly-named Atlas of Peculiar Galaxies. The goal of the catalogue was to image examples of the weird and wonderful structures found among nearby galaxies, to provide snapshots of different stages of galactic evolution. These peculiar galaxies are like a natural experiment played out on a cosmic scale and by cataloguing them, astronomers can better understand the physical processes that warp spiral and elliptical galaxies into new shapes. Such mergers are extraordinarily powerful events that help reshape the galactic terrain of the universe. According to Space.com, they're common at this stage of the universe's evolution and our own galaxy is scheduled to merge with the neighbouring Andromeda one in some four billion years. Though the site noted the massive distances involved mean stellar bodies like the sun have low odds of actually colliding, the solar system could get pulled into the outskirts of the resulting merged galaxy or even ejected wholesale. It may also not be very advisable to be in regions of space close to supermassive black holes that combine during the process of galactic mergers (not that it ever is).